In a narrow alley in the lower middle class district of Abdeen, between grocery shops and local cafes, a big iron door opens up to a dark, spacious room holding the tanboura, (ancient musical instrument) in the background. Al-Tanboura hall reads the sign. As the door closes behind you, separating you from the busy world outside, one delves easily into the enchanting world of story-telling. The last Saturday of every month is dedicated to folk literature, performed by the El Warsha troupe. Arfa Abdel Rasoul, one of the icons of story-telling and acting in Alexandria, has been affiliated to the Al-Thaqafa al-Gamahireya (mass culture), an initiative implemented by the General Authority for Cultural Palaces (GACP) for the past 30 years. The Al-Tanboura hall opened its door a few months ago and is the brainchild of Zakria Ibrahim, the founding member of the Al-Tanboura troupe and incorporates folk songs from Suez, Port Said and Ismailia, derived from the ancient instrument. The art centre showcases the various skills of al semsemya (a smaller version of the tanboura), as well as rango, (Sudanese folk songs) every weekend. Abdel Rasoul joined the Al-Warsha troupe in 2005 and is famous for her stories that draw upon personal experiences, interweaved with the social history of Egypt during the fifties and sixties, in the popular districts of Alexandria. She began with tales recited from folk literature and real life and started with a poem by Palestinian poetry icon, Mahmud Darwish, Ana Imraaa, (I am a woman), where she drifts slightly away from the story-telling mode and leans towards the theatrical and dramatic, while reflecting the essence of a woman, especially as the poem is in classical Arabic. She drifts back again to recite a chapter of the Siyra al helalya, (Bani Helal epic), a masterpiece of Arabic folk literature. She begins by praising the Prophet Mohammed, then tells the tale of Khadra, one of the leading figures of the epic, in the famous berka (lake) scene, where she went with other women to wish upon colourful birds that God would grant her a child. Here Abdel Rasoul depended upon her performance away from the rababa and the chants that usually accompany it, which created some difficulty for the story-teller, due to the numerous characters involved. 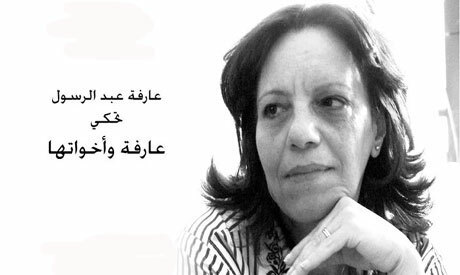 Abdel Rasoul swiftly moved from the southern folk literature to the delta, where she recited a story from Hekayat el daqahlya, (stories of Al-Daqahlia) a compilation of Egyptian folk stories, compiled by Fattouh Ahmed. These stories resemble the Alf Leila w Leila (Arabian Nights) tales. Mabrouka is indeed another interesting tale, formed from the heart of the western desert, Siwa Oasis. Mabrouka is a real woman who still lives in Siwa and her tale revolves around superstition and jinn possession. On another level, Kalbaz zad (Chubby) is indeed a contemporary story based on real events, written by Amal Omar. Moving between sarcasm, contemporary colloquial and the rhyming and terminology of Alf Leila w Leila, the story is concerned with how society perceives us and how we perceive ourselves. Here Abdel Rasoul excels in conveying the dilemma with humour in the story of Amal, who was ridiculed by society for not being the right size. Once she was too thin and was not socially accepted, however when she gained weight, she became a social outcast. She speaks of the long journey of dieting, until she decides that she will listen only to herself. Last but not least, was Damir Seberto (Alcohol Conscious) reflecting how the local community can be accepting, forgiving and open to a woman with a disgraceful past. This story is part of Abdel Rasoul’s collective stories entitled Hekayat Bent El Baal (stories of the grocer’s daughter) in which she paints a vivid picture of the Alexandria suburbs where she grew up, through the innocent, wondrous eyes of a child. She has told these stories several times in Alexandria in plays directed by her husband Mustafa Darwish. Story-telling opens up an enchanting world where we see the imagination of the story-teller. Through Abdel Rasoul’s performance, tone of voice, strong presence, and unlimited self expressions, the audience was enchanted and truly overwhelmed with stories which recalled their grandmother’s bedtime stories. More storytelling performances by Al-Warsha troupe will be held at Al-Tanboura hall, on the last Saturday in January 2011 at 8 pm.